Only 10 minutes drive to the airport and Las Palmas de Gran Canaria, 5 minutes drive to Telde and 30 minutes drive to the beaches in the south (Maspalomas and Playa del Inglés), provides a perfect location within Gran Canaria. In Cortijo San Ignacio Rural Hotel Las Palmas you will find a friendly and familiar atmosphere, carefully managed where you can enjoy an unforgettable stay. At the entrance to “El Cortijo Resort” you will find a roundabout with a sculpture of a half metalic arc in the center. 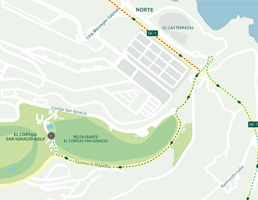 Pass the Restaurant “San Ignacio Golf”, on the left and follow the road for about a kilometer until you find the entrance to the hotel at your right. Pass the Restaurant “El Cortijo de San Ignacio”, on the left and follow the road for about a kilometer until you find the entrance to the hotel at your right. For more information or other options of how to get to the hotel, please contact us. De 08:00 a 20:00 horas.